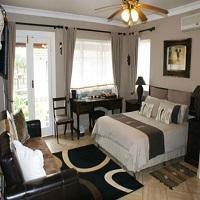 Deluxe Double (Leopard) with Queen Bed + 1 Single Bed (Sleeps 3) with en-suite (bath and separate shower) and air conditioning. 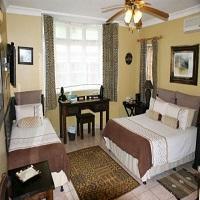 Deluxe Double with Queen Bed, en-suite (bath and shower), and air conditioning. If cancelling 7 days before arrival, forfeit 100% of the booking total. If cancelling 13 days before arrival, forfeit 100% of the deposit. If cancelling 21 days before arrival, forfeit 50% of the deposit. If cancelling 28 days before arrival, forfeit 25% of the deposit. If cancelling 999 days before arrival, forfeit 5% of the deposit.